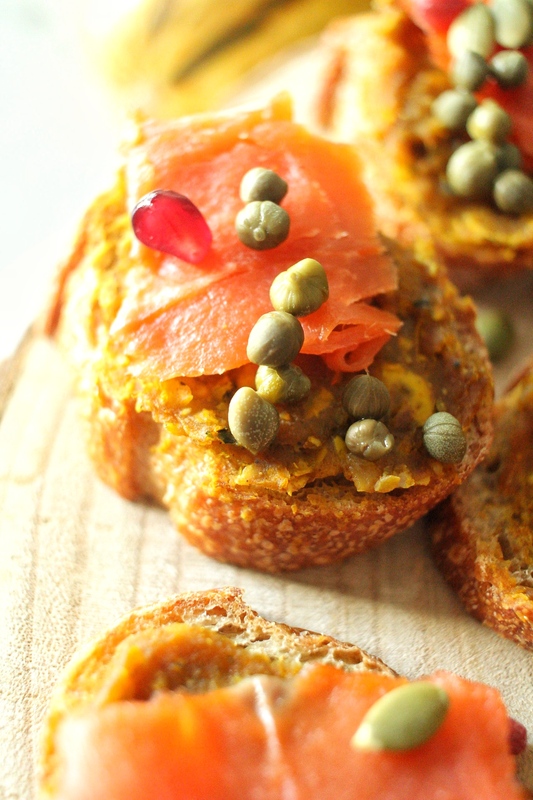 Celebrate the season with an easy smoked salmon crostini with delicata squash butter appetizer. It’s a unique, and delicious party appetizer that incorporates seasonal delicata squash and nutrient-rich smoked salmon. This post was sponsored by the Seafood Nutrition Partnership but as always, all opinions are my own and I’m grateful for your support! ‘Tis the season for holiday get togethers, festive foods, sparkly drinks, and time with friends and family. Food is my love language so whether I’m invited to a party or hosting, I like to get creative in the kitchen and incorporate elements of the season into a dish for the party. I realize that this time of year we are strapped for time, and making something from scratch might not be feasible, which is where this appetizer for smoked salmon crostini with delicata squash butter comes in. It’s a creative take on a traditional crostini, a good portion size for a party, and aside from the roasting of the delicata squash, takes only minutes to assemble. 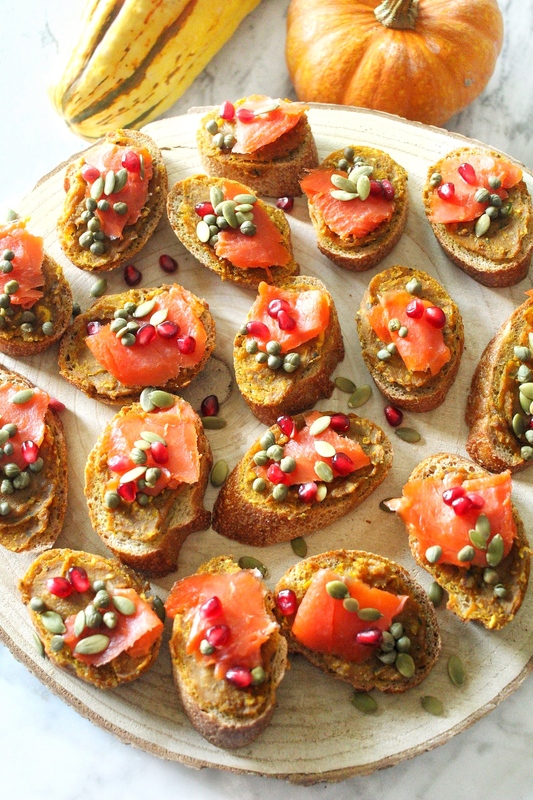 The sweetness of the pomegranate seeds complements the savory, saltiness of the capers and smoked salmon and adds a pop of color to each crostini. And can we just talk about this smoked salmon for a second?! I will eat salmon in any way shape or form, and smoked happens to be one of my favorite ways to enjoy it (especially on top of avocado toast!). If you didn’t know, October was National Seafood Month and I had fun with this recipe of for pumpkin spinach risotto and seared scallops–be sure to check out that post for more information on what to look for when purchasing seafood, sustainability and much more! Since taking the pledge to eat seafood at least two times a week, I’ve enjoyed experimenting with different ways to eat fish and challenged myself to eat fish I never have before. 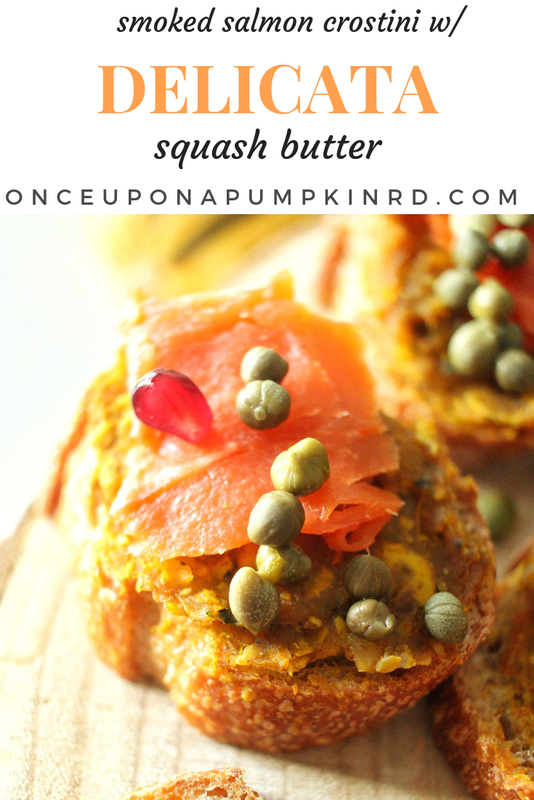 I like this easy recipe for smoked salmon crostini’s with delicata squash butter so much too because it has that fall element of squash and pumpkin seeds that you know I love! If you’ve never experimented with delicata squash, I highly recommend you try roasting it this season because it just may become your favorite type of squash like it did for me. Like any yellow-orange vegetable it’s high in vitamin A, C and fiber. Read more about the produce that’s in season and why it’s so good for you here. Another thing to note about holiday party appetizers is that they are all not created equal! I’m not saying you have to avoid all the appetizers, but it is a moment to be mindful at the party because there will likely be other food, desserts, and drinks that can add up quickly. 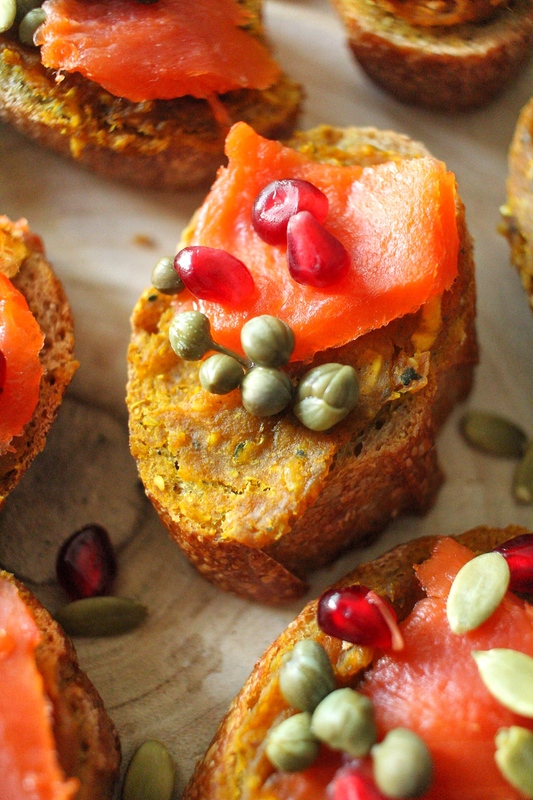 You can feel good serving something like these smoked salmon crostini with delicata squash butter appetizers because you’re getting a good mix of protein and healthy fat from the salmon and unique vitamins and minerals from the delicata squash, pomegranate seeds, and pumpkin seeds. 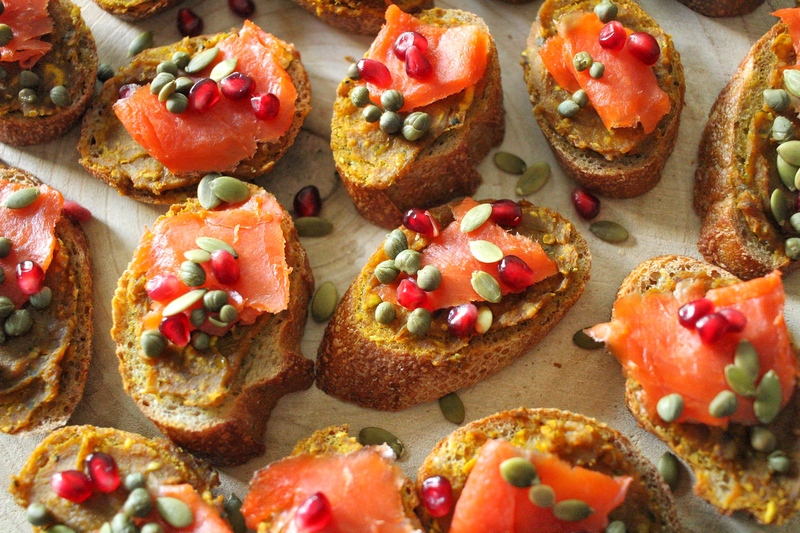 Start any holiday get together in a healthy way with these smoked salmon crostini’s with delicata squash butter! Get the best of both worlds with the taste of sweet and salty and reap the benefits of salmon in an easy to make appetizer! Pre-heat oven to 415 degrees F.
Toss delicata squash with 2 tbsp olive oil, maple syrup, salt, pepper, and turmeric. Roast for approximately 17 minutes. Let cool for a few minutes and add delicata squash and garlic to a food processor. Pulse and add in remaining olive oil. Mixture should be smooth and combined. Cut the bread into pieces about 2 inches thick and place on a baking sheet to warm in the oven for 5-10 minutes. Remove and spoon about 1 tbsp. of squash butter on top. Add small pieces of salmon on top of each, then sprinkle pomegranate seeds, pumpkin seeds and capers spontaneously across the top of each. * I left the skin on the delicata squash which made it come out a little grainy. I didn’t mind this texture, but remove if you want butter to be completely smooth.